This crazy, diverse bowl of vegetarian (vegan, actually, and gluten free to boot) goodness started out as leftovers, a tribute to how many of its components can be made ahead. I’ve been sitting here for the last 27 or so minutes trying to brainstorm ways to streamline all five components to make it, as has been my niche of late, weeknight friendly. If you witnessed the process of me sitting here calculating times and trying to plan lists, you’d understand that simple weeknight dinners are not my forté. My nature is to complicate things, even if it is for the sake of a beautiful meal. It’s taken most of my life thus far for me to figure it out, but I’ve finally started owning that I take pleasure in doing things the hard way. Not, most definitely not, because I relish stress or exhaustion, but because the end result is that much more satisfying when you’ve poured your heart and soul into the process. Even if the process involves peeling somewhere in the neighborhood of 25 tomatoes. So instead of being in the kitchen right now preparing this sweet potato stir fry bowl so I might have a chance at photographing it in natural light, or even drafting the recipe to try to accurately narrate the dish as it appeared a couple weeks ago on my table, I’m writing my way through the internal battle between viral easy weeknight recipe and thoughtfully created but ignorant-to-the-clock-and-life dinner. What’s the verdict? I have to stay true to the original on this one. It’s the properly pressed tofu, striking grill-marked sweet potatoes, and slow cooked brown rice that make it blog-worthy in the first place. 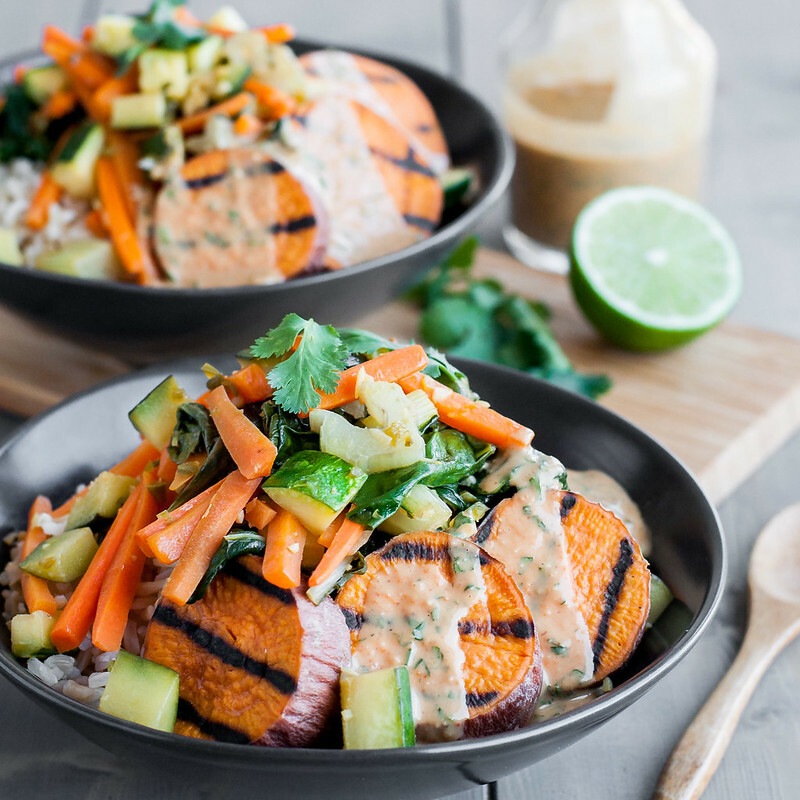 You could save these bowls for a weekend, but I propose capitalizing on all the make-ahead opportunities (or alterations, further down) so that it’s even possible to serve a nutrient-packed, flavor powerhouse when you need dinner now. All of these can be stored, covered, in the refrigerator for at least a couple days. Two hours of make ahead prep?! To answer your question, yes, sometimes I have a lot of time on my hands to make dinner, and I take full advantage. One minute I’m pulling leftover julienned veggies from last night’s spring rolls for a quick sauté, the next I’m realizing I have the makings of a multi-part, Thai flavored stir fry bowl of my dreams. So instead of waiting 10 minutes for dinner, Steve waited about another 45…or so. It’s okay, though…I fed him cheese in the meantime. Or more like tossed cheese from the kitchen to the couch, to try to avoid another body slowing me down. Sidenote to Mom: I’m sorry for every time we hovered and whined while you cooked dinner. I feel your pain. To calm your fears, though, because so much of the time saved is inactive and all these tasks can overlap with each other, there is not two consecutive hours of make ahead prep involved in the stir fry bowls (see the recipe for more accurate prep and cook times, which take into account your ability to do other tasks while the rice cooks). Besides the make-ahead options, I toyed with several other ideas for streamlining the dish. Ultimately, I’m opting for the original recipe I created, but here are some ideas for altering the full recipe if you’re short on time. Pick and choose. This is really 4 or 5 recipes in one. Serve the peanut sauce with just one or two of the other components (e.g., stir fried veggies + tofu), instead of all four. The sauce is what makes it! Roast sweet potato rounds in the oven while the rice cooks (instead of boiling and grilling them). Peel and cube sweet potatoes 1/2″ and add them to the rice with 5 to 10 minutes of cook time remaining. Bake the sweet potatoes whole and serve “in their jackets”. Serve the tofu raw, which is probably healthier anyway. I think I’m feeling sufficiently less guilty about posting a lengthy recipe after arming you with enough ideas to make this recipe work for your lifestyle, that it’s time to hop in the kitchen and actually make the thing. Take this recipe step by step, and you'll end up with a gorgeous, healthy bowl of vegan and gluten-free goodness. The steps are in the order I recommend for maximum efficiency. If you find yourself standing around at any point, work on the next possible step. Press the tofu (do ahead). Lay the whole block (or 2, depending on packaging) on a thick layer of paper towels or a folded, clean dish towel set on a dinner plate. Cover with a few layers of paper towels then balance something heavy--like a cast iron pan or cookbook--on top. Make sure the object isn't so heavy that the tofu crumbles beneath its weight. Leave alone for 30 minutes. Remove from press setup, then cut into approximately 1½ by 1 inch rectangles, ¼ to ½ inch thick. Refrigerate, covered, until ready to use. Cook rice (do ahead). Bring 2½ quarts water to boil in a large pot with a lid. Rinse rice under cold water in a fine mesh strainer for about 30 seconds. Add to boiling water, stir once, then boil gently, uncovered, reducing heat if needed, for 28 to 30 minutes, until rice is tender. Drain rice in a strainer for 10 seconds, then return to pot, off the heat. Cover pot with a dish towel then the lid for 10 minutes, allowing rice to steam and absorb remaining moisture. Uncover, fluff with a fork, and salt to taste. Pre-cook potatoes (do ahead). Bring a pot of water (about 4 qts.) to a boil. Slice potatoes ½" thick. Add 2 teaspoons salt to boiling water, then lower in potatoes. Boil 5 to 7 minutes, until tender when pierced but not falling apart, checking frequently. Rinse gently with cold water in a strainer. Cover and refrigerate until needed. Prep stir fry veg (while rice cooks). Mince the jalapeno, garlic, and ginger and combine in a small dish. Julienne or thinly slice (1/8") carrots. Chop or slice zucchini to ¼" cubes or slices. Separate chard stems and leaves. Slice cleaned stems ¼" to ½" thick and combine with carrots. Wash and chop or tear leaves into 2" to 3" pieces. If prepping ahead, store in air tight, refrigerated containers. Make peanut sauce (do ahead). In a liquid measuring cup, whisk all ingredients except salt together until smooth. Add and incorporate water to thin. Season to taste with salt. Store covered in refrigerator, bringing to room temperature for a half hour before serving. If sauce was made more than a day ahead, check to see if it needs more seasoning. Grill potatoes (optional). Heat a grill pan or the grill over medium while you melt the coconut oil in a small dish in the microwave. Lay the boiled sweet potatoes on a baking sheet or cutting board and brush one side with oil. Place oiled side onto the grill and cook 7 to 9 minutes, until visible grill marks appear. While the first side cooks, brush the second side with oil and season with salt. Use tongs to flip slices over and cook on other side about the same amount of time, seasoning the first side with salt as the second side cooks. Serve immediately with the bowls, or keep warm on the baking tray in a low oven, partially covered. Fry tofu. In a non-stick skillet, heat 1 tablespoon peanut oil over medium to medium high until very hot but not smoking. One of these is helpful, as the oil may splatter. Lay half the tofu (or more if it will fit) large side down in the oil--it should sizzle. Cook 4 to 6 minutes on each side, undisturbed, until golden. Remove to paper towels and sprinkle with salt. Add remaining oil to the pan, allow to heat, and fry remaining tofu the same way. Tofu can also be kept warm in a low oven. It will stay crisp on a wire rack. Make stir fry. Combine lime juice, tamari, and sesame oil and set aside. In a large (at least 12"; use the pan from the tofu if it's big enough) skillet, heat peanut oil over medium high until shimmering. Add jalapeno, garlic, and ginger mixture and cook about 15 seconds. Add carrots and chard stems and cook until just tender, 4 to 5 minutes, stirring occasionally. Add zucchini, chard leaves, and 1 to 2 tablespoons of water and cook until chard is wilted, zucchini is just tender, and water is almost evaporated. Add soy/lime/oil mixture and simmer gently for a couple minutes, stirring, until mostly reduced. Remove from heat and serve immediately. Serve it up! 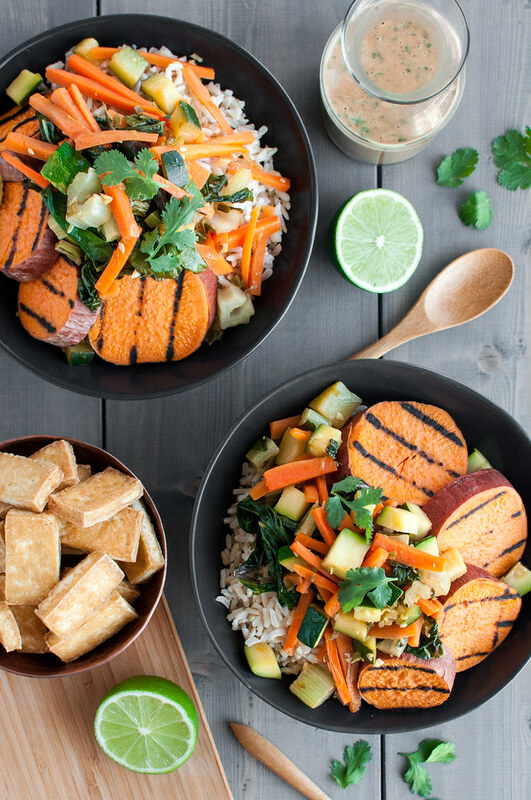 Fill bowls with rice, potatoes, stir fried veggies, and fried tofu. Serve peanut sauce, limes, and cilantro at the table. As written, the recipe is gluten free and vegan. Times do not include inactive time to press tofu. The method of cooking the rice is different from most package instructions, and it takes the guesswork out of how much water to use. It works with all types of brown rice, but I haven't tested it with white. I like to use peanut oil since it stands up to high heat. You could try another high smoke point oil, such as certain vegetable oils or coconut oil. I wouldn't recommend canola due to the bland flavor. 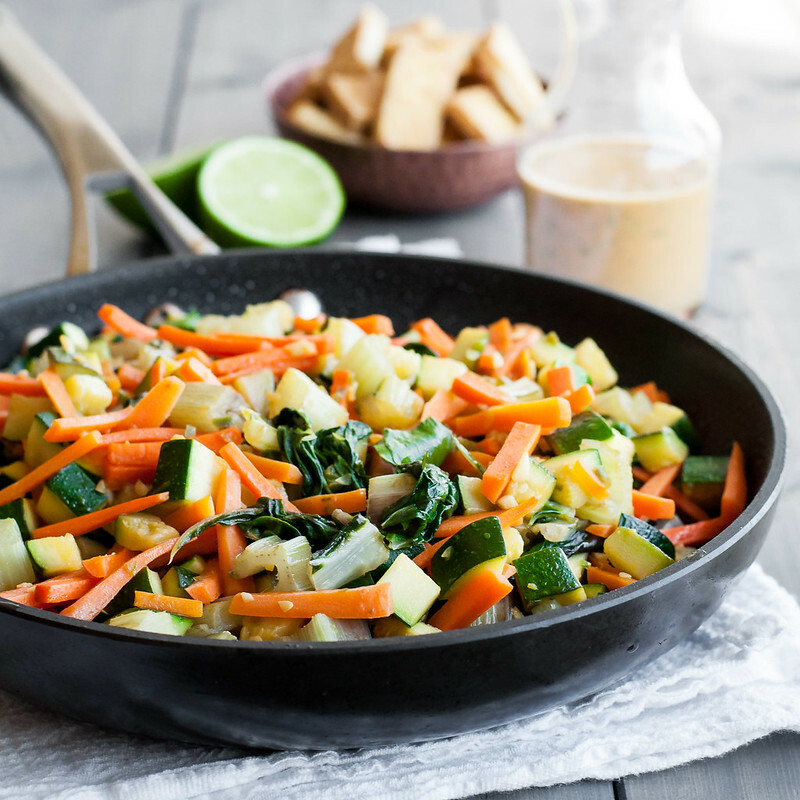 Cook times in the stir fry step may vary slightly--it makes a big difference how hot your stove is. Mine tends to run very hot (think campfire), so I try to normalize the temps I used when posting the recipe. Your best bet is to watch for the indicators given. Peanut sauce inspired by Deborah Madison's The New Vegetarian Cooking for Everyone. Note: This page contains affiliate links. It does NOT contain sponsored content. 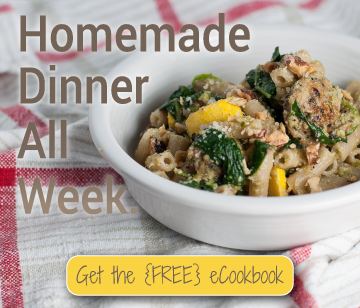 Affiliate links (to products I recommend, on Amazon) offset my ingredient and website maintenance costs, so I can keep bringing you multi-part recipes like this one. Thanks!